This series will involve racing one vehicle with one driver of record in the races listed below for 2018. Drivers must commit to an ULTRA4 Regional Series to race the triple crown and there will be additional criteria that allows a driver to take part. Keep an eye out for more details on the Triple Crown in the coming weeks! Register today to take advantage of the lowest entry fees of the season. 2018 Registration, Yellowbrick tracker rental and Hammertown address requests are now available on ULTRA4Racing.com. USAC insurance will be available by 12/1 for the 2018 season. Pricing for KOH Week and the entire season is listed below. All drivers must login to register. If you’ve raced with us in the past, you already have a driver profile. Please do not make a new profile as your race history is associated with your existing account. You must login with your username (or email address) and password. If you don’t remember your password, simply click on “request new password” with the username or email address you used. Select the “season commitment” button if you wish to receive a discounted entry fee at KOH for committing to race at least 3 regional races next season. 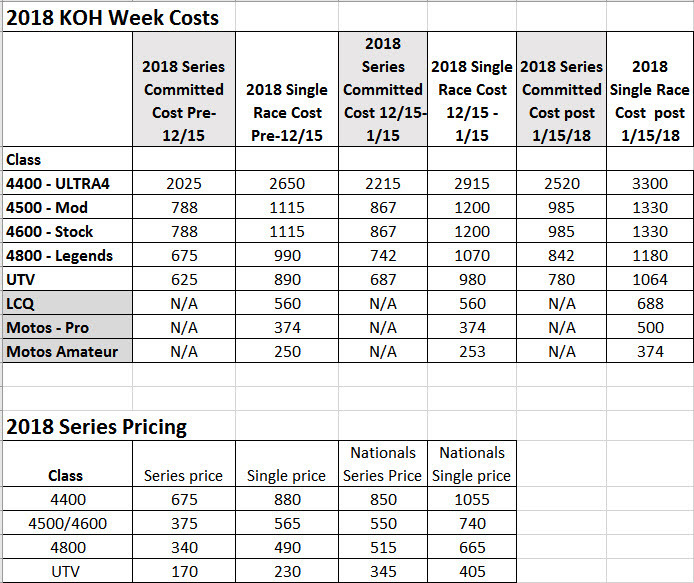 For those signing up for KOH Week, you have two options, you can select either the single race price (more expensive), or the series committed price (less expensive). Drivers that commit to racing at LEAST 3 races in either the Eastern or Western Regional Series receive a significant discount on their KOH Week Entry fee as well as their series entry fees. You DO NOT need to pay for the whole series until after KOH. Series committed drivers must pay for the season by April 1st. PLEASE NOTE: Drivers that select series price and do not race 3 races will be charged the KOH price difference plus a handling fee. Good news for series committed drivers! The prices for racing both 2018 KOH Week and the 2018 season will remain the same as 2017 for all classes. Single event regional race prices will also remain the same as 2017, only KOH Week single race prices have increased moderately (10% or less). All pricing for the season is below. As always, those that register early will pay the lowest entry fees for KOH Week, so don’t delay.